The oil and gas sector is the backbone of the Algerian economy accounting for about 35% of the gross domestic product and two- thirds of total exportation. Algeria has large shale gas reserves, thanks to which it is positioned as one of the first producers in the world. After Russia, it is the main supplier of gas in Europe and the first supplier on the African continent. OPEC member since 1969, 80% of hydrocarbon production is managed by the local company Sonatrach, one of the largest energy players in the world. The remaining 20% is managed by several foreign oil companies including British Petroleum, Eni, Total, Repsol, Cepsa, Statoil and, Anadarko. Despite the highly promising figures, in recent years statistics have instead shown a decline in foreign investments due to several reasons. Amongst the most important: a corruption scandal, security issues, Algeria’s current hydrocarbon law and its fiscal terms to partnering with international oil companies, low oil prices and, operational challenges. According to a Bloomberg report of March 22, Sonatrach has focused on an investment of over 50 billion dollars in the period 2017-2021 in all its activities in order to increase production. Algeria’s national oil and gas producer tried to increase production after a prolonged period of inactivity due to the slowdown in foreign investment. Sonatrach aims to increase oil production by 14% in 2016-19, thanks to an investment of $9 billion to explore new upstream projects. Among the operational maneuvers, the company has also signed or extended collaborations with foreign energy firms such as Pertamina in Indonesia, Spanish Spain Compañía Española de Petróleos SAU (CEPSA) and Italian Eni SpA with the aim of increasing production. The current Algerian legislation on hydrocarbons and its fiscal conditions have become an obstacle to collaboration with international oil companies. Attempts to revise the Algerian government will begin with a bill in June 2018. The Algerian Ministry of Energy also plans to invest $78 billion in upstream activities by 2021. 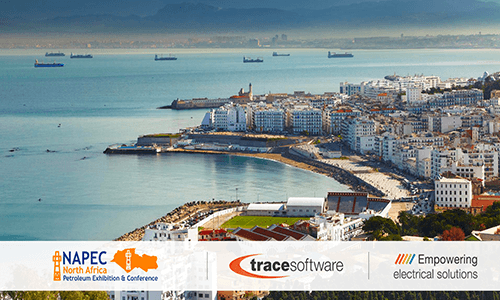 Trace Software International, aware of the enormous potential of Algeria, sells its software solutions for the segment of hydrocarbons and gas. 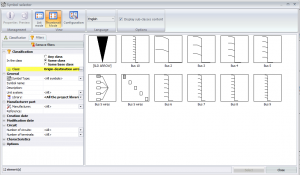 For example elecworks™ P&ID is a dedicated software to create industrial process design diagrams (“Piping and Instrumentation Diagram”, P&ID) and fluid circulation plans (“Process Flow Diagram” PFD). Thanks to hyper passing circuit’s characteristic, wires can be joined automatically by customized symbols. Inside of elecworks™, user can find out several examples about these symbols under origin destination classification. Also, in this way, user can get the control about this buses from component browser. Looking at wire cabling order, these symbols are transparent, so they will not appear in connection reports. In this way, schemes can be simpler. Also, users can save time as just 2 symbols can join so many wires as user’s decision. Removing one symbol, user does not lose the other one, keeping for a future use. The purpose of this Tips&Tricks is to group several wires in a bus and connect them in another project place. https://www.trace-software.com/wp-content/uploads/2015/04/logo-home-ts.png 0 0 Rossana https://www.trace-software.com/wp-content/uploads/2015/04/logo-home-ts.png Rossana2018-03-16 16:39:552018-03-16 17:12:47How is it possible to handle bus wires in elecworks™? 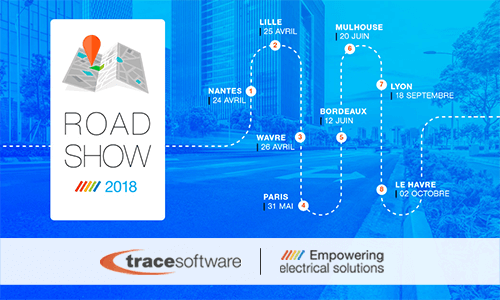 Trace Software International, the leader in the development of software solutions and consultancy services for the industrial engineering, is pleased to announce that the second edition of the roadshow will be held shortly in France and Belgium. A great season has just begun for Trace Software International. After the success of the first edition, the company decided to repeat the roadshow experience. April 24th in Nantes, April 25th in Lille, April 26th in Wavre, May 31st in Paris, June 12th in Bordeaux, June 20th in Mulhouse, September 18th in Lyon and October 2nd in Le Havre. During the tour you will meet the experts, get to know software solutions thoroughly, undertake face to face sessions to assess business needs, attend specific demonstrations to understand how to get maximum benefit and maximum efficiency. Initiatives like the roadshow are important because they take place in a pleasant and much more interactive atmosphere. They are an opportunity to confront and discuss new ideas, exchange common interests and consolidate synergistic relationships. “Roadshows are the ultimate events in the field. After the success of the first edition, we decided to repeat the experience. Bringing our brand to the road is a more interactive and compelling way to engage and connect with potential customers and partners. At Trace Software we firmly believe in the great added value of innovation to compete on the markets. The goal is to create an unforgettable experience that reveals the human side of the company. Every relationship is based on trust and this is the right opportunity to know who is behind our software solutions ” CEO Pedro Puig. Trace Software International, the innovative company committed to the development of software solutions for the engineering industry since 1987, is thrilled to announce that will exhibit at the 8th North Africa Petroleum Exhibition & Conference – NAPEC – at the Oran Convention Centre in Algeria from the 25th until the 28th of March 2018. NAPEC – with 25789 participants and 540 exhibitors from 40 countries across the globe – is the leading oil & gas business hub of the North African market, an exclusive gateway to relevant business opportunities. 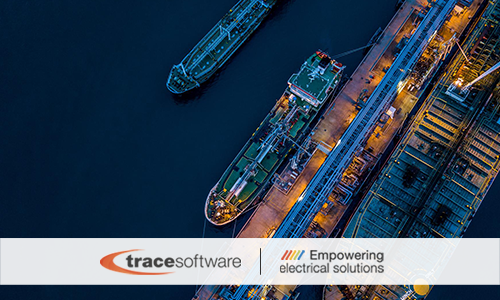 The North Africa Petroleum Exhibition and Conference – NAPEC – is a superb platform to showcase the software solutions tailored to satisfy the oil & gas industry experts’ needs: elecworks™, elec calc™ suite and archelios™ suite. Trace Software International will be attending the event together with its official partner Intellisolutions. They will be welcoming you at booth C4-23 during all the event. elecworks™ is the worldwide bestselling electrical CAD system for automation projects and electrical installations. With 30 years of unique expertise in the design of tools for the creation of electrical projects, it is possible to affirm electrical engineering is in the company DNA. Integrated in the elecworks™ standard license, elecworks™ Fluid is a specific solution to design hydraulics and pneumatics automatisms & projects, which can be linked to the electrical installation. 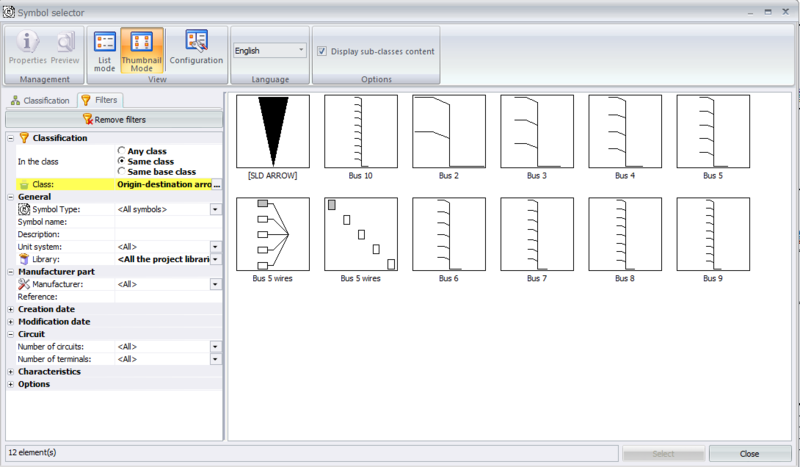 Only one single software solution is needed to perform an integral design for all the automation and control projects. elec calc™ the CAE software solution dedicated to the sizing of electrical installations, the only one in the world that allows to integrate the management of high and low voltage in the same project. With more than 3.000 licenses sold, it is a reference in electrical calculation. elec calc™ BIM is the world’s first and only calculating software that seamlessly integrates elec calc™ with different design platforms enabling the importation of the digital model in IFC 4 format, generated by any 3D architectural software’s (Revit, Archicad…). This is the essential solution to manage entirely any photovoltaic project. From the feasibility, profitability study, simulation and calculation of the project, to the electrical sizing, this all-in-one software solution is intended for PV installations of all types. archelios™ and archelios™ Pro are software solutions conceived for PV professionals to design, edit and share projects of the utmost precision, from rooftop to huge ground mounted. archelios™ Calc ensures optimal security with real-time photovoltaic calculation of the installation. The latest addition to the archelios™ suite is archelios™ O&M, the monitoring software for PV installation. It shows a unique approach on BIM for PV, as it brings all the benefits of PVBIM mock-up design to advanced PV monitoring. 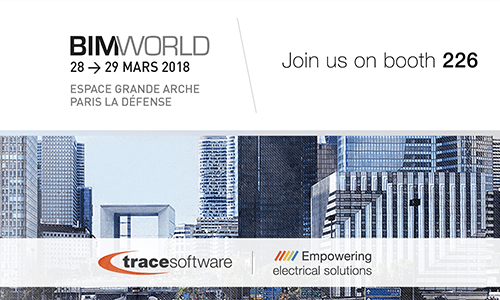 Trace Software International, the leading company in the creation of design software solutions for the electrical engineering since 1987, is thrilled to announce that will exhibit at BIM WORLD in Paris on the 28th and 29th March 2018. Trace Software International has chosen BIM WORLD – the promoter of digital transformation for construction, real estate industry and urban planning to showcase elec calc™ BIM as the essential software tool to fully integrate the electrical installations within the BIM process. Although construction has been slow in adopting digital technologies, we are now entering the era of “connected construction”. Building Information Modeling (BIM) technology represents the turning point, implying a disruptive impact for all the for all engaged sector players. Trace software International views this event as a unique chance to network with BIM experts from across the world, meet global business opportunities and share the best practices within the BIM ecosystem. Trace Software International will participate to the exhibition together with the avant-garde partner BIM&CO – The BIM Contents Company, free and cloud based, highly social and collaborative. This is the professional community which delivers building product data to BIM projects. Both key players will be welcoming you at booth 226 and 227 during all the fair event. 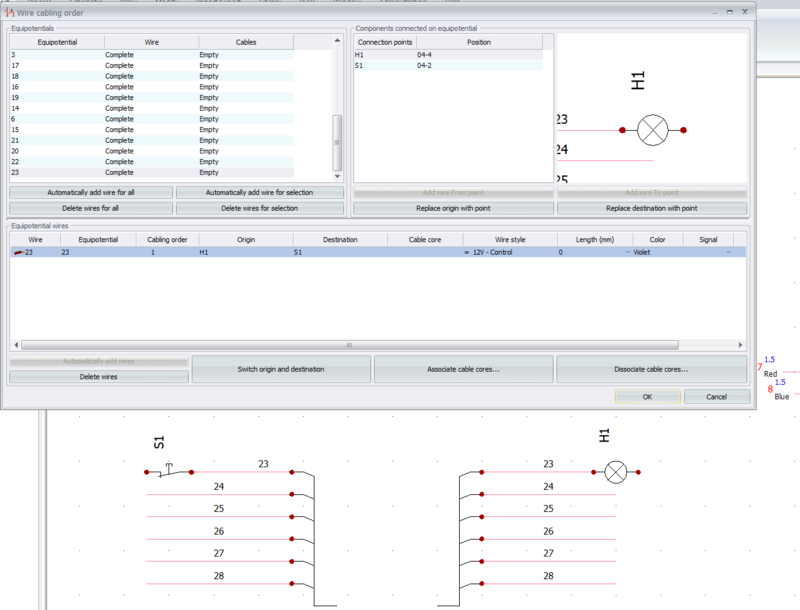 This is the world’s first and only calculating software that seamlessly integrates elec calc™ – the electrical tool used in the calculation and sizing of projects – with different design platforms enabling the importation of the digital model in IFC 4 format, generated by any 3D architectural software’s (Revit, Archicad…). elec calc™ BIM allows to receive the 3D model updates, to import a review of IFC and receive a notification of the changes in the installation one-line diagram. Several simulations can be done to compare the possible routing scenarios. The 3D model allows the detection of any conflicts. If this is case, the information is directly sent to the designer thanks to the BIM Collaboration Format (BCF) so he can fix the problem and correct his model. elec calc™ BIM allows information to be shared by different participants along the different stages of design, construction and operation. With BIM representing the essential digital revolution in the building industry, elec calc™ BIM is the unique electrical design solution aimed to those who do not want to stay behind. As engineering process becomes more complex and the international scenario is more and more challenged by the increased competitiveness and pressure for innovation, the efficient management of the product life cycle plays a critical role as a resource to create business value. The operational logic of a PLM software is based on the shared access to information, resources, and processes related to a product or service throughout its life cycle. The centralized management of all the stages along the entire value chain increase operational efficiency and quality of the processes- which become simplified- while also encouraging greater interaction among all the participants in the engineering project. 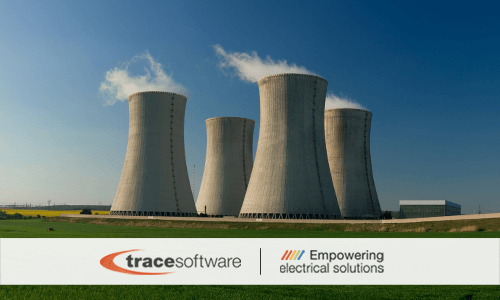 Since 1987 Trace Software International has been a global leader in the development of software solutions (CAD & CAE) for the industrial engineering, with a unique expertise in the design of electrical installations. 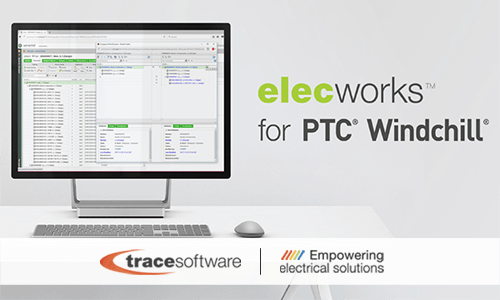 Thanks to the partnership with leading PTC, Trace Software International has conceived elecworks™ for PTC® Windchill®. 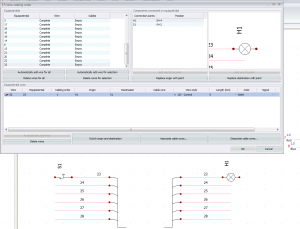 This is a module of elecworks™ – the design software for automation projects and electrical installations – which effortlessly integrates the electrical data in the PLM system. From ideation through product development, from manufacturing to product support, elecworks™ for PTC® Windchill® covers the whole product value chain delivering strategic business value. The PLM integrated software technology accelerates time-to-market, leads operational efficiency and productivity, enhance transparency and boost innovation. elecworks™ for PTC® Windchill® is a link that operates with PTC® and its Product Lifecycle Management, (PLM) tool Windchill® which will enable you to control data access, manage revision control and full documentation through new automated abilities. Costs of reworking projects are on the rise – the cost of poor quality projects and communication can add up to a loss of business and potential loss in market share along with customers. elecworks™ for PTC® Windchill® makes certain that every part of your project development process quality is improved as the continuous and greater centralization of product data along the whole value chain is guaranteed. As projects development become more intricate, using our link with PTC® Windchill® makes it easier to manage the different stages and changes to your projects through their lifecycle. Effectively gauge the compliance and performance of each project, as well as any risks to ensure such regulations as – REACH, RoHS, and WEE. Also, assess your projects that they are adhering to specific requirements, for example, product cost, carbon footprint and sizing. Manage organizational IT systems more successfully with the reduced costs associated with running our elecworks™ for PTC® Windchill®. Without a complete, digital Bill of Material (BOM), teams across your organization will feel the sting of increased costs, decreased product quality, and delayed time to market. elecworks™ for PTC® Windchill® enables you to adopt a central approach to managing your BOM with a single source for stakeholders. Organizations implementing the PLM software solution can expect both top-line and bottom-line benefits. It helps companies to improve their strategic positioning in the market and to increase the revenues. It is easy to get started. You can ask for a trial version HERE. elec calc™ – the software for low voltage and high voltage electrical installations calculation – represents an optimal solution able to meet the needs of the critical facilities sector which include such areas as Hospitals, Nuclear Energy and Data Processing Centers. elec calc™ features all the necessary functions to carry out a complete analysis of critical facilities with detailed studies. It further allows the user to check several operational scenarios such as emergency, network change-over – to analyze each operational condition using the behavior and sizing of the installation. Incorporates a full suite of applications that are essential to the optimal sizing of the installation along with the correct maintenance during the installations life cycle. Reduce energy consumption and save on costs with accurate designs for optimally sized electrical installations. Ensure from the start point that your project quality is of the highest caliber and meets all the local and international standards required. elec calc™ is focused on safety, service continuity and energy efficiency in compliance with major worldwide standards. elec calc™ offers the user to manage operating modes to simulate and control different installation configurations (normal operation, standby, maintenance …). elec live™ allows you permanent access to all data of the electrical installation on any fixed or mobile terminal with a web browser. elec calc™ offers critical calculations for factors such as earthing systems, cable ampacity, short circuit currents, thermal stresses, voltage drops and discrimination studies between protections are key, for continuation of supply. A good discrimination study allows the coordination of different protections at different levels of the installation, to guarantee the continuity of supply and service within critical installations in case of failure (short circuits and overloads). elec calc™ is designed to manage installations with multiple voltage levels, both HV and LV in the same project, in alternating current for frequencies of 50 or 60 Hz. Full calculation of the installation is carried out each time a change is made to the installation.